Fossil have today announced the acquisition of popular fitness tracker manufacturer Misfit, in a move which aims to position them as the most fashionable fitness tracker brand in the market. We have spent the majority of 2015 commenting about how fitness bands are increasingly more chic then geek. Misfit have been leading the way, epitomising the new breed of start-up in this space, focussing on delivering a product which is as aesthetically pleasing as it is useful. Fitness trackers sit prominently on your wrist, and are worn all day long. Therefore, inevitably, they are judged on their appearance. The popular press, such as the Daily Mail in the UK have been vocal critics – not that we should be put off by that – claiming that these bands don’t do anything to aid our fitness. Even if we’re a proponent of these devices, we have to admit that often case their use cases are a little tenuous. Therefore, they sure as hell best look good and be fashionable. This is where the Misfit and Fossil collaboration comes in. Priced at $260m, the acquisition of Misfit is a serious statement of intent by Fossil, showing their intentions in this space are very real, and that fashion and technology in the lifestyle space are quickly conjoining. Earlier in October – yes that recently – Fossil launched 2 new trackers and a smartwatch, representing a rapid emergence into this space. The timing now looks curious, considering this news. A $260m purchase is not concluded in days and is does not happen without some pretty serious prior thought and consideration. You’d therefore have thought that this partnership may have halted the delivery of their trip of trackers. However, the approaching Christmas season and other considerations will doubtlessly have played a serious thought in this. So what will the Misfit/Fossil partnership look like, and how will it aid Fossil in launching seriously stylish and fashionable bands? Firstly, Misfit have a very solid tracker tech base. Their devices have impressive battery lives and good style pedigree. They also have a solid fan base, which interestingly includes fitness professionals, not least personal trainers. PTs are a good barometer of the fitness space, as they live and breathe it. They’re a measuring stick for current gym fashion trends, and are generally the sort of folks who like to be out in front of such movements. They also doubtlessly play a strong part in leading and inspiring these trends to flourish – so being the choice of tracker on the wrist of a pT is quite shred marketing. Now, you can add the parent groups other brands, like Michael Kors, and this further highlights the new movement towards technology companies collaborating with fitness or lifestyle brands in order to deliver their own specialities to market. Only last week, Tag announced their new Tag Heuer Connected, a device which marries their typical watch making beauty with the brains of Google and Intel. This is the first sign that a serious watchmaker now sees the future of such fashion items as been intricately linked with technology. 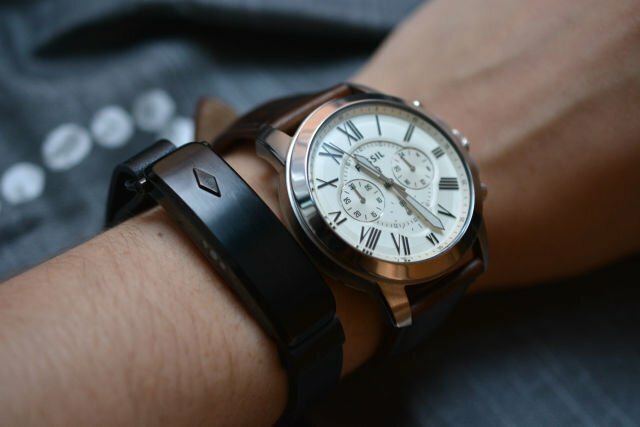 As we observed in that article, if you can get all of the style benefits of a Tag watch with all of the Android brains of Google and data skills of Intel – you get the perfect watch. Maybe the future of trackers and smartwatches is tied to such collaborations? Certainly this partnership opens it up for Michael Kors and the Fossils more premium brand layer. This certainly seemed to be chief amongst Kosta Kartsotis – CEO of Fossils – thinking when announcing the buy. It seems that the wearable space now sits at a inflection point. Brands like Fitbit, Jawbone and Runtastic – itself acquired by brand giant Adidas – have proven the market and built formidable companies. Fitbit is flying, holding off to date the mergence of Apple in this space, and big brand players like Asus are arriving. However, when it comes to great looks and fashionable trackers, the original players do it best, and do not rely on gaudy plastic and bright colours. Is the future of wearables in brand partnerships between leading players in the lifestyle space and upstarts in the wearable tech scene?